I read this article and found it very interesting, thought it might be something for you. 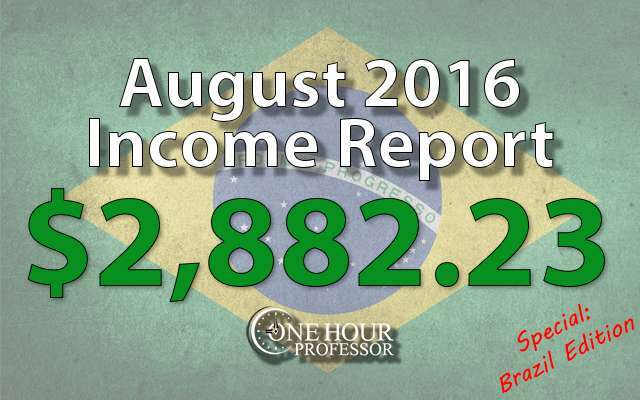 The article is called August 2016 Monthly Income Report and is located at http://www.onehourprofessor.com/august-2016-monthly-income-report/. August was another big month for my online businesses. 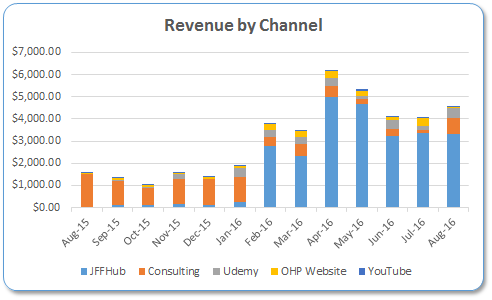 My biggest month ever for my Udemy course sales and a big month for consulting as well, plus I started another website which is focused strictly on Ecommerce which I’ve always wanted to do. I’ll explain more about it below. 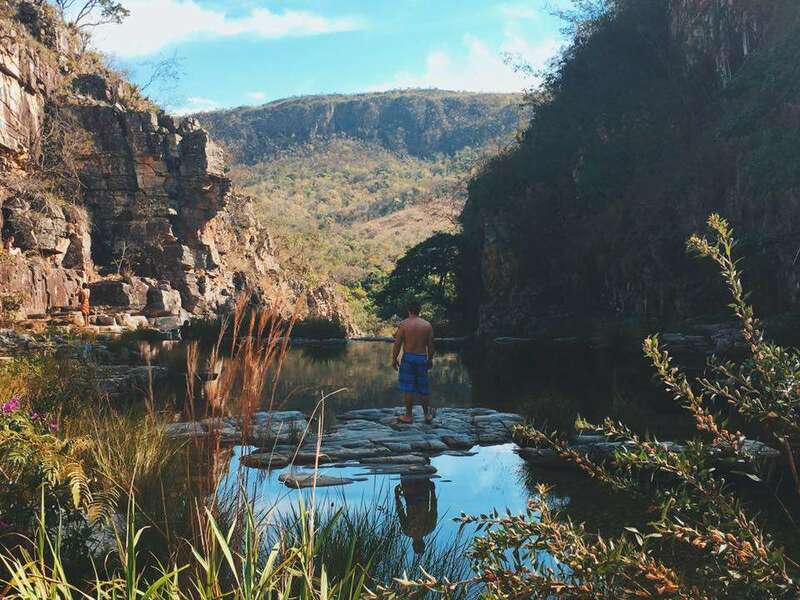 In addition to all of that, this is a special edition income report because I’m writing from a beautiful little place in Brazil called Minas Gerais. This is by far one of the prettiest places I’ve ever been, and maybe the picture below will give you an idea of why that is. It’s time like these when I REALLY feel like an internet entrepreneur. All that I’ve needed the entire time I’ve been here to keep up with everything is the internet and my computer….and that’s an amazing feeling. I think one of the coolest things is that since I’ve been here in Brazil, I’ve made right around $700 and I’ve barely worked at all. It’s a very unique situation that frankly, I never thought I’d be in. I always thought passive income was the coolest thing and everyone else seemed to be able to do it, but I never thought I could. Lucky for me, it seems like I’ve really hit my stride with passive income and I just need to grow my portfolio even further to make more money. 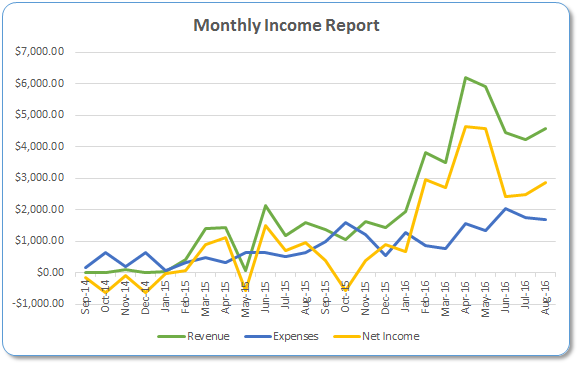 My income thankfully increased a little bit this month due to Consulting and Udemy sales. Both were nice additions to my regular income and although the consulting wasn’t passive, the rest of it absolutely is. I’ve come to realize that JFFHub is going to be making right around $3000 – $3500 per month for the time being and I am 100% fine with that. All I do at this point is proofread and post 3 blog articles per week and keep up on Social Media, so the work is a few simple hours each week. This website has become my biggest accomplishment so far and I’m hoping the link building I do will continue to make it grow. Consulting revenue increased mainly because my one client had a big project to complete. I didn’t get anyone new or anything like that, just an increase in work and billable hours. Udemy revenue increased because my Email marketing course was a “featured course” and that increased sales significantly. Though I’m excited about the increase in sales, I’m more excited with the new students. After this month, I’ll have officially made back all of the money I spent to create my last Udemy course so it looks like I’ll be working on a new course soon. The expenses this month weren’t anything out of the ordinary. Most of the money was spent on content and I also had some expenses in website development. I really want to create an Ecommerce business. Because of that new ecommerce website, I have a few not so common expenses. First is the Fiverr work, which is really just a logo designer. Second is the Shutterstock expenses, which is the main image on the website homepage. Third is a product called Easy Azon. This is simply a product that will significantly reduce the amount of time it takes for me to put affiliate links into my blog posts. Other than that, most of the other expenses are similar to other months. JFFHub Update: At this point, JFFHub is pretty much on autopilot. The blog post reviews take around an hour per week, and the link building doesn’t take more than five hours a month. The reason why the link building is so simple is that I’m actually leveraging my own email list to build links, so prospecting for new opportunities is almost non-existent. I plan on a full link building project by offering a $500 scholarship in the future, but I’m not offering this until I’m ready to do the work associated with it. The idea is that I’ll offer the scholarship and contact hundreds of schools over a few months to link to the scholarship page. This will result in a wide variety of .edu links from multiple sources, which should increase my overall domain ranking and push me ahead of my competitors. Consulting Update: As expected, this was a good month for my consulting income. Basically, my one consulting client decided to start a large project and I think the bulk of the work is done. There will probably be some additional work in September, but for now it looks like the bulk of the work was in August. Udemy Update: I was really happy to see my Udemy sales this month. This was officially my best month on Record for my Udemy courses and the reason is because my Email Marketing course was a featured course for the entire Business section of the website. This had a significant impact on my earnings for the month and I’m hoping that it stays up there for as long as possible. My plan with Udemy is to always pay the cost of a course before I move on to the next one, and this one officially made it so that I am now making money with Udemy and no longer recouping my expenses. This means that I’m now able to work on another course, but for right now I want to focus on my websites because courses take a lot out of me to complete. I was originally going to create an outsourcing course, but I think instead of doing that I’ll survey my students to ask them what they want and go from there. OHP Website Update: It was a pretty weak showing for my OHP website this month. For whatever reason, Thrive Themes barely got any commissions and my overall income was reduced significantly. I still haven’t sold any courses on the OHP website and I’m really starting to lose faith in trying to do this. I don’t know where the disconnect is, but every time I try to sell a course to my own email list it seems to fall flat. I’ve probably spent 30+ hours trying to figure out a good “funnel”, but nothing seems to work. So, because of this, I’ll be cutting my losses here and just posting income reports and the occasional blog post when I feel like it. Right now my time is better spent on projects that produce an ROI. TJHQ Update: Interestingly enough, my extra work (Implementing an email list/autoresponder and posting more blog posts) on TJHQ has seemed to actually REDUCE the amount of income I make from the website. Granted, it’s only been a month and I think I need to give it more time, but for now I’m just going to let this website sit and collect and see where it goes from there. Authority Website #1 Update: I’m still waiting on my developer to finish what I need done for this website. It’s been a very confusing project, but he has some revisions he wants me to review right now and I haven’t been able to because I’m in Brazil. I return on September 15th and after that, I’ll dive in and see if he did the revisions correctly. This website has a HUGE market and could hit 250,000 website visitors monthly if I am able to rank where I’d like to in search engines. My goal with this website is to bring in another $1000 each month and hopefully grow it beyond that over time. Authority Website #2 Update: My second authority website is already done being designed and I have a writer in place who is focused on creating content. I know this website won’t be anywhere near as big as JFFHub, but I’m hoping that it hits around $500/month once It’s completed. If I can get it there, I may consider selling it or I’ll just hold on to it for the extra income, still undecided. I’m predicting no more than 25,000 visitors each month when this website is completed. YouTube Channel Update: No update needed here, not planning to do anything else with YouTube until I launch another course. Ecommerce Website Update: This is a website I’m creating because I’m bored of making similar websites. With this website, I’m going to be able to write goofy articles, swear in my content, and say a lot of things I wouldn’t say anywhere else. The idea behind this website is to start with an Amazon affiliate website model selling various products to a male demographic. I won’t get into the niche, but it plays off the “Macho” stereotype that men have and is pretty fun to write about. Over time, my plan is to create content and blog posts that sell specific male oriented products. I’m thinking after writing for a few months, I’ll be able to see trends on what the top selling products are. Once I figure that out, I’ll look into sourcing products where it makes sense under my own brand. When I do this, I’ll increase my margins significantly and then I will be running my own online it can really be a large business. Once I’ve made it grow, I’ll either look into selling it or I’ll just keep it and hire someone to handle the sourcing junk that comes with an Ecommerce website. This is a long term project, but I think it has the potential to be my biggest revenue earning website yet if it goes well. Did I Meet my Goals for August? It took quite a bit of work, but I have rebranded the website and added an autoresponder. We’ll see what this means for the future of the website, but as of now it hasn’t done much to increase the revenue. This one actually might be done, but I haven’t been able to check over the work yet because I’m in Brazil. I’ll look into this sometime this month and see if it’s all done correctly. The housing database was launched and is fully functional now. I’m happy to report that it’s already about halfway done paying for itself. In total, it cost around $500 to get done and it’s made about $250. Eventually this will be another part of the JFFHub website that will hopefully grow my income a bit and be completely passive. In terms of back links to the JFFHub website, I fell a little short at 17 total backlinks. I think I can do a little better this month, but we’ll see what I average after some outreach. This is all going to be determined by how fast my writer can work. Thus far, she’s doing a good job in producing content but each of the articles that I’m asking for are over 2,000 characters each. I’m doing this because this is a smaller niche website and I don’t think it will ever produce a ton of income, but it has low competition and should stay that way for a while. Because of this, if I have her write in-depth articles and correctly implement SEO I think there’s a good chance that I can rank. The link building strategy for Authority Website #2 is going to be a little difficult. I can’t offer a scholarship and I have no list to work from, so I’ll probably just have to start from scratch here. There is definitely a market for this niche, but I’m not sure how many other websites will want to link to the content. We’ll see once I start working on it. The last goal for this month is to build out the content I’ve already had researched for Authority Website #1. In order to do this though, I need my developer to complete his task so it’s going to only happen if he’s done his job. This is exciting because once I put the new content in, it’ll grow my website to over 750 pages and from my experience, the more quality content you have, the better you rank. Because of your reports I started tracking my time and I was shocked how much time I’m spending. I’m very grateful to you for sharing this idea as I’m finding it very useful. Good luck with your September goals. I’m looking forward to reading the report.